I despise The Hunger Games (2012). Why, you might ask? Never before has the idea of children killing other children been so squeaky clean like a toothpaste commercial and Disney-fied than The Hunger Games. It is acceptable for children to watch it with it’s PG-13 rating and the fact that the plot involves children MURDERING other children and not showing the consequences and repercussions of their actions other than surviving to win a tournament is reprehensible. The concept is sick and does not deal with the violence it is attempting to depict in a responsible way. Not only is it irresponsible, it is atrocious. So while the latest sequel to The Hunger Games is cleaning up at the box office, why not give the foreign film that clearly influenced it a chance. Battle Royale was released in Japan back in 2000, a full eight years before the first Hunger Games novel was published and unlike the way that film made kids killing their peers seem so safe and normal, Battle Royale never feels safe, in fact the whole time you watch it you feel guilty because it is so shockingly violent and morally depraved. In fact the filmmakers never even explain why these children are dropped onto an island to kill each other, just that they have to or they will die, leaving the audience to try and figure out why this is happening. Thank you Asian cinema for treating audiences with intelligence and leaving something to the imagination. No mainstream blockbuster would ever give the audiences that much credit or freedom to not be told an important part of the exposition like that. Be forewarned, Battle Royale is sick, graphic and shockingly entertaining and it is what The Hunger Games should have been if it were not trying to desensitize our youth to violence for millions of their parents dollars. 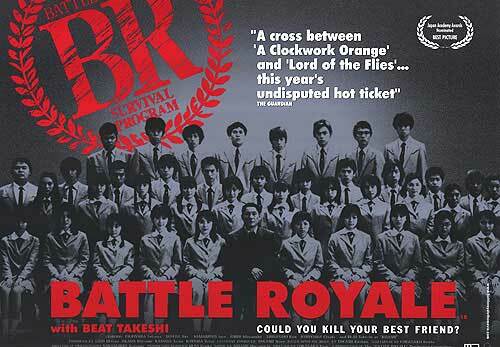 Battle Royale is a twisted cult classic that found its audience and has undeniably influenced American films. Battle Royale is currently available to stream on Netflix.